Your Disney World or Universal Orlando vacation is not the time to experiment with a new sunscreen. Know what works for you and your family BEFORE you go. 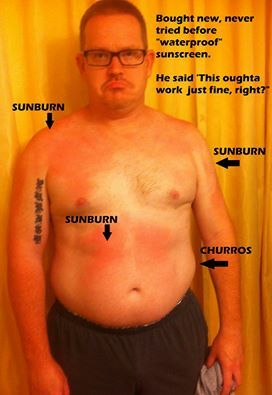 Don't get badly burned at Blizzard Beach or Volcano Bay, baby! Tip for A Better Disney World or Universal Orlando Trip: Know Your Sunscreen! Take a few minutes and educate yourself about SPF (higher isn't always better), UVA and UVB protection AND the LIE of "waterproof" SUNSCREEN. It's hot, humid, and sweaty - especially at the water parks. Oh, and repeat after me: "Re-apply, re-apply, re-apply." Disney World Vacation Tip: Eat Outside Your Comfort Zone - you'll be glad you did! Disney has SO much more to offer than burgers and chicken - foods from all over the world are at your fingertips, so be open to trying new things - we bet you'll find something absolutely wonderful you didn't know existed! We tried a lunch at Sanaa, at Disney's Animal Kingdom Lodge, on our last trip - out of the ordinary for us. We ordered butter chicken because we recognized the words "butter" and "chicken", but what were tamarind chutney, red chile sambal, and cucumber raita? We have no idea, but they were delicious. Vindaloo? Completely clueless, but it tasted awesome. We didn't even know "kefta" was a word until our daughter ate it. Give something new and unexpected a try - odds are you'll be glad you did! If not.....Pineapple Whips cure most ills. About the author: Toni is a travel agent specializing in Orlando theme park vacations. She is an expert at helping her clients find a wonderful balance of theme park fun and relaxation.